Perhaps not always as much as they should. In an era of increasing sensitivity to marginalized groups, many evangelical college students feel their faith still is often treated as a punching bag both inside and outside the classroom at public universities. But new research indicates there is great potential for universities to play a major role in moving past stereotypes and animosity to integrate evangelicals as valued members of student bodies. A just-published study analyzed data from more than 11,000 non-evangelical college students. The researchers found that getting to know evangelicals in settings from general spiritual activities on campus to classroom discussions on diversity led to greater appreciation. And the first waves of an ongoing study of more than 20,000 students at 122 schools found that 85 percent of participants, including 82 percent of evangelicals, considered it important for their campuses to provide a welcoming environment for individuals of diverse religious and non-religious perspectives. As inclusivity becomes a priority on campuses, the door is opening for greater sensitivity for all religious groups, including evangelical Christians, said Matthew Mayhew, a professor of educational administration at Ohio State University. And it is a door university officials need to walk through as they prepare students to meet the challenges of a highly divided political and social climate in the U.S., he suggested. Evangelical Christians are a diverse and vibrant population, which has soared in numbers in the last half-century. That’s due in part to both innovative approaches of meeting spiritual needs and the removal of status barriers that had limited spiritual mobility in Protestantism. There are hundreds of different expressions of evangelicalism even among major movements such as Pentecostalism and myriad Baptist traditions. Independent non-denominational congregations have been among the fastest areas of growth. Nearly six in 10 evangelical students in the 2015 wave of the Interfaith Diversity Experiences and Attitudes Longitudinal Survey (IDEALS) scored high on a pluralism scale measuring acceptance of other worldviews and the need to understand world religions. Another 43 percent had a medium score on the scale. But the narrative of evangelical Christians portrayed in popular culture and the media often includes intolerance, scandal and intellectual inferiority. That is reflected in the perceptions of many of their professors and peers, some recent studies suggest. In the study just published in the Review of Religious Research, researchers from Ohio State, North Carolina State, the University of Iowa and Brown and Baylor universities analyzed data from 11,400 non-evangelical students over three years of the Campus Spiritual and Religious Climate Survey. Other Christians, including mainline Protestants, Mormons, Eastern Orthodox and Catholics, held relatively favorable view toward evangelicals. The reverse was the case with students who identified as agnostic, atheist, Buddhist, Muslim, Jewish, nonreligious, or secular humanist. They were significantly less likely to say evangelicals were moral and ethical people who are tolerant and make positive contributions to society. Yet the study also identified several practices that were associated with greater appreciation of evangelicals even among groups that included their harshest critics. •	Had classroom discussions that challenged them to rethink their position about another worldview. •	Participated in general religious and spiritual activities on campus. •	Engaged in interfaith work with diverse peers. •	Informally talked with evangelical peers about differences. But creating greater respect and acceptance is not something that happens on its own, researchers suggested. Negative attitudes toward evangelicals more frequently occurred on campuses with a divisive psychological climate — where students more often feel silenced when sharing their own experiences with prejudice and discrimination. For example, evangelical Christians and atheists may say they want all voices to be heard on campus. But when it comes to evaluating one another, tensions surface. In the interfaith diversity survey of college students, just 29 percent of atheists were highly appreciative of evangelicals; the same percentage of evangelicals expressed similar admiration for atheists. University administrators also face the challenge of addressing prejudice against evangelicals, while helping them understand what may be their own implicit biases as a group that is predominantly white and members of the nation’s majority faith. So how can universities help non-evangelical students develop more nuanced understandings and appreciation of evangelical Christianity? 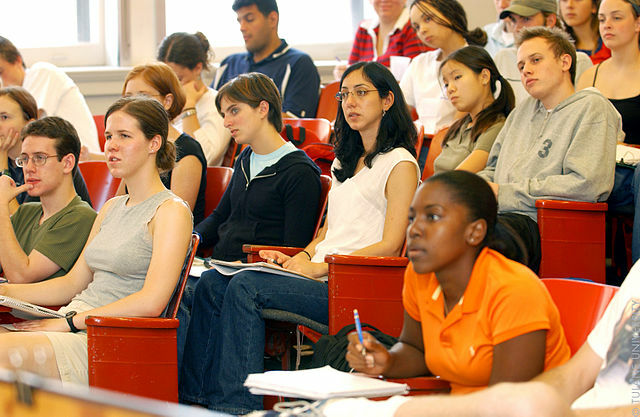 •	Providing evangelical students with on-campus opportunities “to engage, struggle, and feel heard.” When evangelicals feel alienated at school, they tend to gravitate toward off-campus ministries or parachurch groups where they are less likely to interact with non-evangelical students, Mayhew noted. •	Having interfaith educators work closely with diversity officers to develop curricula that addresses historic forms and expressions of Christian privilege, while also presenting information about minority viewpoints and marginalizing experiences within Christianity. •	Training new faculty to respect different faith traditions. •	Supporting productive exchanges across religious and worldview differences. Dialogues and classroom discussions conducted with humility, where participants are open to learning from one another, have the best chances of success. Promoting religious diversity is not only part of the educational mandate to provide a climate where “each and every student” can thrive, Mayhew said. But as schools continue to push the envelope on diversity to include groups such as evangelical Christians, they are also providing students with the skills to meet the challenges of moving past prejudice and beyond tolerance to an appreciation of people of different backgrounds and beliefs.